If they keep breeding at this rate, there'll probably be a Dark Horse near you before your birthday, and the latest location seems to be doing just fine on Queen near Bathurst, in an area now known for its abundance of cafes. I've been told to be at the Queen West Dark Horse at noon, where I meet Derek, who's also in charge of the place just before the lunch rush begins. There's a quiet moment, however, so we head to the back of the shop. 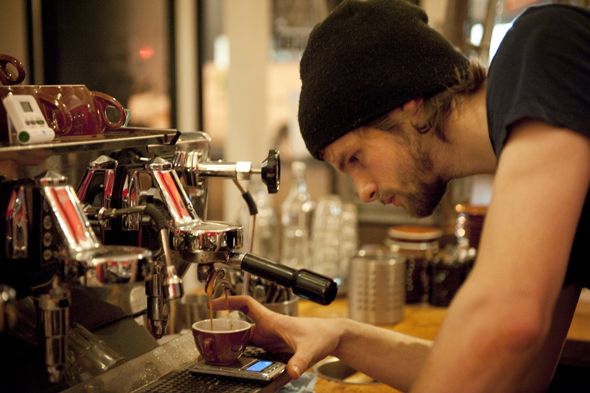 I've been a barista I guess since 2009. 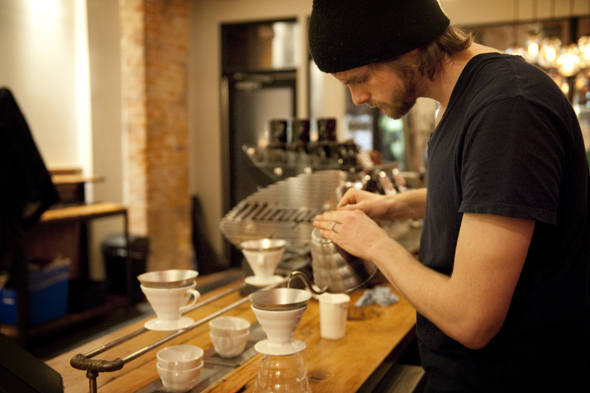 I was a barista for about eight months at a coffee shop in Kingston, and then I was off for a year or so doing other things and I've been working pretty steady for about a year and a half now. I would have to say a lady that comes in every day here and she orders pretty much the same thing , a latte. She's very personable - I love talking to her. She comes in, she really enjoys our coffee. She comes in with two kids in the morning and she comes in again usually later on in the day and gets the same thing. She's just a great customer. Do you moonlight as a writer, actor, artist, and/or adult film actor? What's something that no one else knows about you? I'm a pretty open book, I would say. I don't think there's anything. I would have to say either Lakeview Diner, or I love hanging out at Cherry Bomb on Roncesvalles. Best album to spin at work? 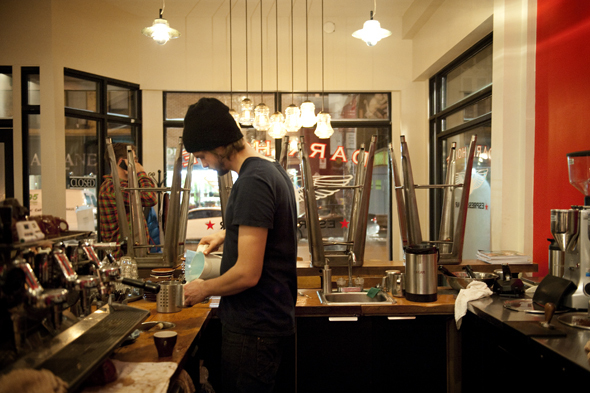 To take the nerves out of customers, how do you properly order an Americano? Just straight up, black. Or if it's cappuccino just the way it is - I don't add anything to it. Rob Ford or Tim Hortons? Oh man. You're asking me to get political here. Tim Horton's.